Winston Churchill's weighty words remind you to face challenges in work and in life head-on. Mr. Churchill was certainly a man who knew how to hold up under pressure. Even as his country was at war, with his own city under bombardment, he urged his nation to, "Never, never, never, never give in." 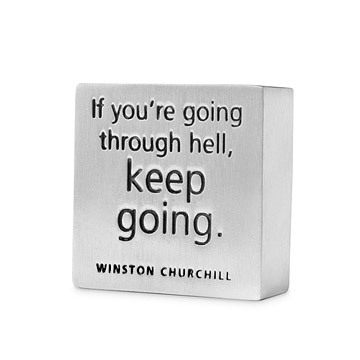 With characteristic wit and determination, this quotational paperweight is sure to help you get through your own battles with a stiff upper lip. Made in Vermont of lead-free pewter. Comes in presentation box. 1.5" L x 1.5" W x .5" D ; 5 oz. A nice weight to it, especially for the size. I am very happy with my purchase! I would buy this again, great message. You should add Thank you to the list of why it was purchased. A nice gift for a friend going through a difficult time. One of my best friend's is going through chemotherapy, and this Winston Churchill quote has become our battle cry. Perfect Gift. Really nice product. Cute packaging. The saying had personal meaning.